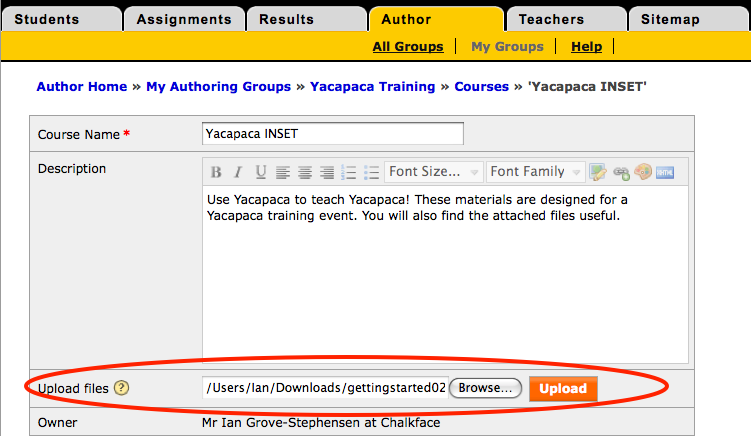 Want to include files with your course description? Now you can. Use them for teachers’ notes, rubrics, class handouts etc. Upload them in the Course edit page in your authoring group. They will appear in a small table in the course description. Remember the course description is visible only to the teacher, and it is essential information for colleagues to understand the context in which they should use the quizzes and tasks you have authored. This entry was posted in Authoring, Yacapaca. Bookmark the permalink.